Имате въпрос към Guangzhou Royal River Waifiden Apartment? Guangzhou Royal River Waifiden Apartment е перфектен избор за пътуващи, които желаят да почувстват духа на Гуанджоу. Центърът на града е на около 2 km, а до летището може да се стигне до 45 минути. С удобното си местоположение хотелът предлага лесен достъп до всички градски забележителности, които задължително трябва да се видят. Възползвайте се от богатството на ненадминатите услуги и удобства в Гуанджоу. Докато са отседнали в този чудесен хотел, гостите могат да се насладят на 24-часов рум-сервиз, безплатен WiFi достъп във всички стаи, 24-часова рецепция, съоръжения за инвалиди, експресно настаняване/напускане. Гостите на хотела могат да изберат една от 68 стаи, в които се усеща атмосферата на спокойствие и хармония. Освен това в хотела можете да се възползвате от множество предложения за приятно прекарване на свободното време. С перфектното си местоположение и несравними удобства, Guangzhou Royal River Waifiden Apartment е един чудесен избор в много отношения. Room size was OK, staff were OK, location is good. Too many little annoyances that prevented me from leaving a "recommend" statement. They provide tea bag, cups and kettle, but no tea spoon, coffee or sugar/sweetener. Front desk don't supply them after asking. Shower space is tiny, our elbows could touch both sides of the wall without being outstretched. There is an electronic console by the door that has a bright flashing light which can light up the room at night so had to use a towel to cover this. You can hear the noise of the elevator rollers all the time. Unpleasant smell in the room, probably from previous guests accumulated smoke and food. Shame really, the place has potential and sounds good from the advert, but sadly not that great. Отседнахме 8 вечер/и в декември 2018 г.
It’s bascially a service apartment but truly dissapointed as they provided microwave which, induction cooker & oven, those are pretty good but they never provided any cutlery, plate or bowl. Not even dish washes. The place is good but lack of maintenance which we found many light bulbs are broke. Staffs are great, they are friendly and willing to help on the concern areas. Location is great which we enjoyed the most by walking distance to the riverside and walking distance (5-10mins) to train station. Convenient stores are just downstairs within 5 mins walking distance. Shopping restaurant and any others all area around this hotel. Very good location. 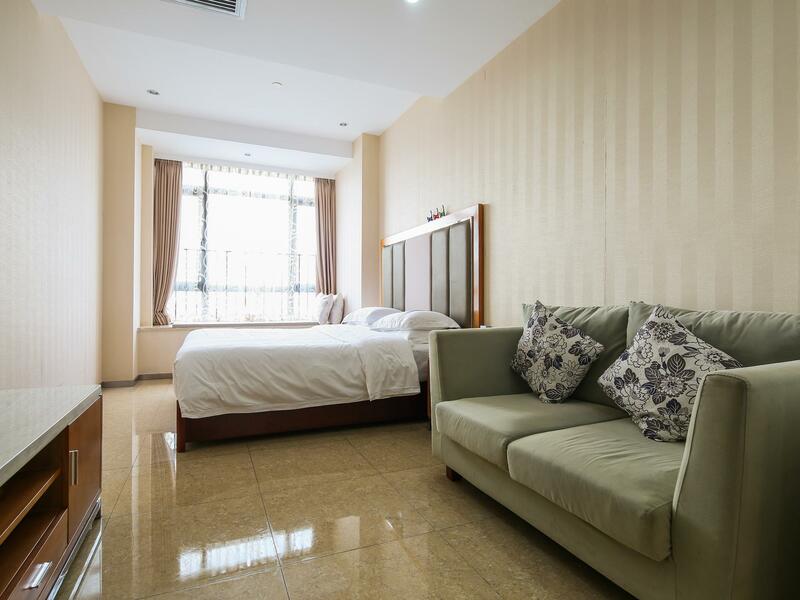 Pros: a few minutes walk to subway Near beijing road (shopping street) A lot of restaurants around Big rooms Clean floors Cons: the headboard had drop stains. I don't know if they don't clean it or they can't clean it. We booked a room with no breakfast. But at check in they said we have breakfast from 7:30-8:20. So I asked where, and she pointed to where she was standing and said "here". I asked a couple of times, also tried acting like I was looking for a room or something because I thought she didn't understand me. Turns out the breakfast was really "there" beside the corner where they keep luggages for safekeeping. The breakfast was bread and drinks on a table. There's also plastics to put them in. We laughed about it, but it was a plus nonetheless since breakfast was really not in our booking. So all good. Wifi was also good. First time staying in a service apartment in Guangzhou... I book this hotel as its situated close to my business places. First impression on arriving this service apartment is average as this building stays local residents. Though i was told the levels I'm staying are sseparated from locals, i did observe some units with different gates installed. Pictures on agoda look similar to actual. however, the room doesn't feel clean. Room does have washing machine and hi-tech toliet bowls etc. 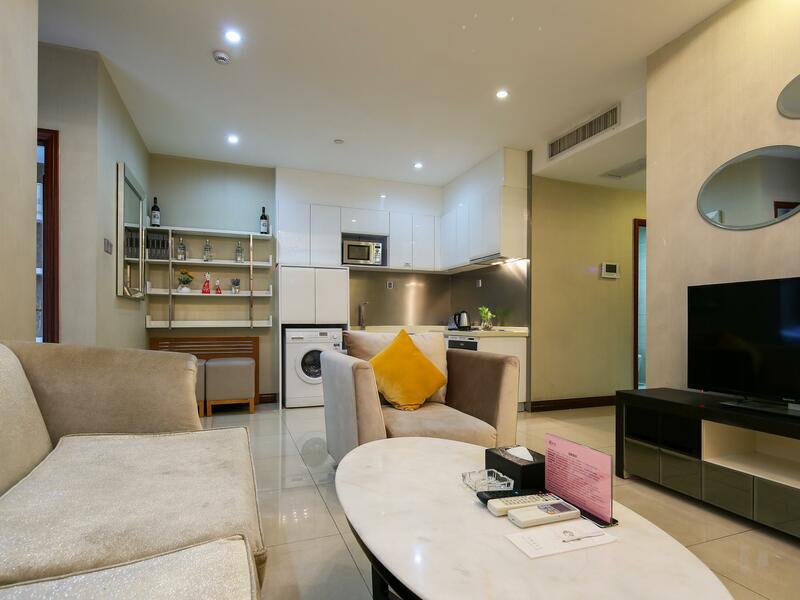 Halfway my stay, i was told to relocate to another service apartment in Tianhe due to authority disallowing foreign passport holders staying in this area mainly due to close proximity to an area named "Xiao bei" where alot of African pple are staying. Honestly, this Tianhe apartment named Wan Jia Marriot Apartment is alot better.. just 1 complaint.. bed is extremely hard. convenient location; fast checkin/ checkout/ high speed wifi. the rooms is quite big. A lot of TV programmes/movies can be chose. wifi is very good too. if you are looking for night life, you can just go downstairs and bars/ disco are just close to the hotel. the bathroom was not clean enough. 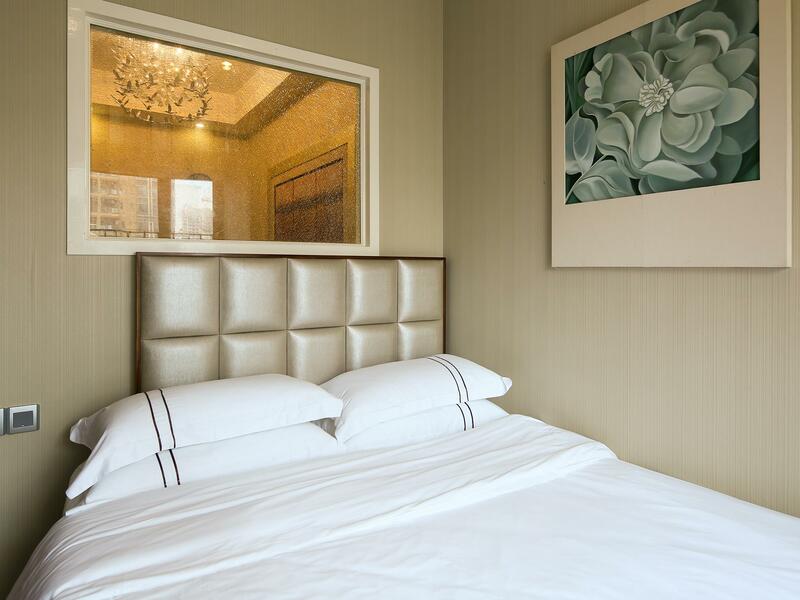 stay in a better place with this price. Not satisfy with the room. We had a good 4 nights stay at the apartment. 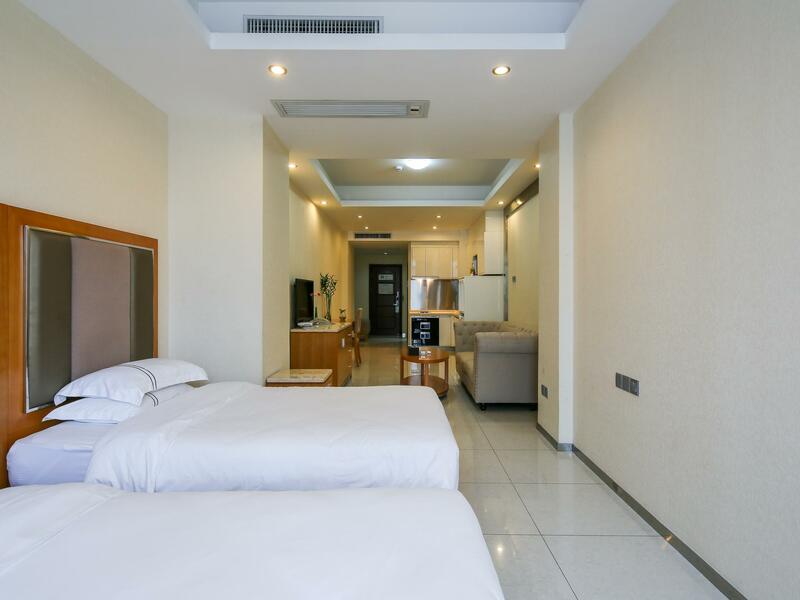 Room is clean and walking distant to major shopping area. I booked a double room which is spacious and neat. The beds and floors were clean however there was a stain on the sofa and toilet was very small. The location is a bit far from haizhu metro station, takes around 15 mins of walk from exit F, past zhujiang river and left turn into a small lane. There is an eatery near the entrance of apartment which often has many customers and thus it feels safer to walk into the small lane late at night. One good thing about this location is that it is very near Beijing road of less than 10mins walk to it. However, you will need to walk quite a distance down to the other end of Beijing road that is more lively. There is a seven-eleven and also some chinese restaurants at nearby yanjiang road. The hotel staffs were not so friendly, they did not help me to book cab. It was pleasant to stay there, staff were friendly, room is clean and bed is good. Location is good, close to stasiun and many F&B. My only complain is towel is not good quality and there is small kitchen with microwave,stove washing machine BUT not even have spoon or plate....only 2 cups to make chinesse tea. Nice staff but difficult to deal with. Need English speaking at receptionist, easy for international traveler to communicate with. Отседнахме 23 вечер/и в октомври 2015 г.